Our personalized skincare platform combines epigenetic testing with ingredient-based algorithms to screen for brands that are best suited to the current quality of your skin. Current skin quality. Measurable regimen. Our method connects the current state of your skin to the functionality of ingredients from thousands products on the market. Truly personalized skincare. First, we generate an epigenetic profile of your current skin quality. SKINTELLI is a direct-to-consumer personal epigenomics test that measures DNA methylation levels of a proprietary panel of genes responsible for key skin quality factors (e.g., aging, elasticity, moisture retention, etc.). Our at-home kit provides non-invasive adhesives to collect samples from your skin (rather than saliva) which properly reflects quality changes after environmental interaction. You'll receive a kit to non-invasively collect samples directly from your skin, and then mail them to our lab for epigenetically targeted next-generation sequencing, followed by an analysis report. We measure a combination of key indicators: aging, firmness & elasticity, moisture retention, sun exposure, skin rejuvenation, sensitivity response, oxidation & antioxidation, and pigmentation. Our database of functional ingredients and their epigenetic effects on the tested skin indicators allow us to algorithmically determine the most optimized skincare products on the market for your skin profile. 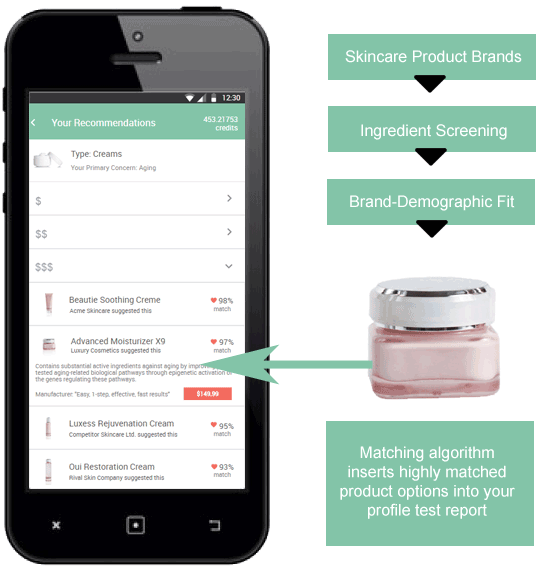 Recommended personalized products that are filtered through our matching algorithm, followed by trackable and measurable progress, facilitate true improvement in the aesthetics and quality of one's skin. Next, we intelligently match your profile against thousands of brands. The SKINTELLI web platform empowers you with the knowledge of which products truly work for your skin. Instead of generalized marketing, companies must use our matching system to market their brands to you based on your unique skin profile -- if it's not qualified for your skin on an epigenetic basis, it gets rejected. Matching is filtered by our A.I. algorithm based on epigenetic, hazardous, and absorbance effects of the ingredients on the tested skin quality indicators. EpiGentek is a biotechnology company specializing in epigenetic assays and reagents, as well as contract research services. EpigenCare's research and development efforts are supported by EpiGentek. Ranked #1 on Google for keyword "epigenetics", WhatIsEpigenetics is an educational news site for maintaining a healthy lifestyle through an understanding of epigenetics. EpigenCare is part of Johnson & Johnson Innovation's JLABS incubator program that provides access to equipment, mentorship, research initiatives, and industry contacts.